Share the post "Bidens Ferulifolia Or Fern-leaved Beggarticks"
Bidens ferulifolia is a dazzling Mexican plant, which brings sunny color, casual style and easy care over a long season as an annual, perennial or a houseplant. Apache beggarticks has a low, spreading habit, small, finely divided bright green leaves and rich yellow daisies. It is a sun-loving and showy in bloom plant. The flowers are attractive to bees and butterflies and require little deadheading. 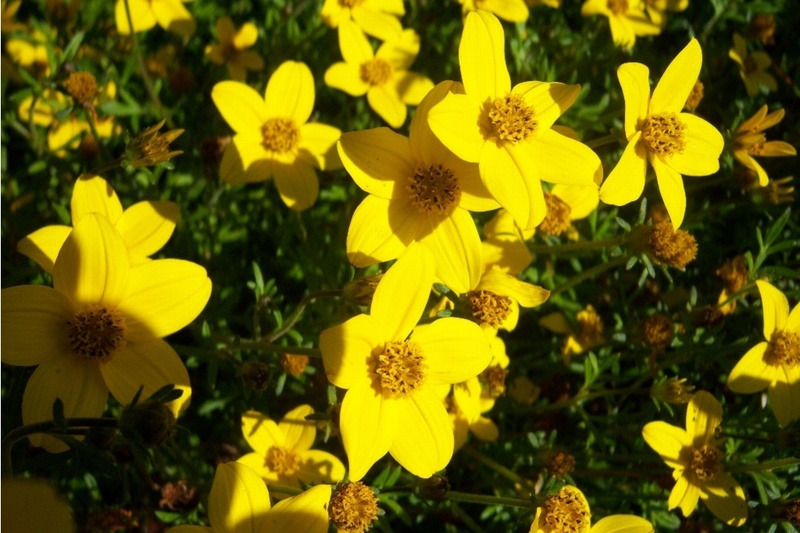 A mix of open, broad petaled golden yellow flowers and airy, rich green foliage make Bidens ferulifolia an excellent choice as a filler, companion or feature plant. Genus: Bidens. The common names of Bidens include beggarticks, black jack, burr marigolds, cobbler’s pegs, Spanish needles, stickseeds, tickseeds and tickseed sunflowers – which refer to the bristly fruits that end in two sharp barbs and tend to stick to clothes or animals’ fur. Just a great adaptation for seeds dispersal. The genus name are of the same character. Bidens comes from the Latin bi (two) and dens (tooth). Cultivars: ‘Golden Eye’, ‘Yellow Charm’, ‘Golden Goddess’, ‘Gold Marie’, ‘Peter’s Gold Carpet’. Propagation: by seed or stem cuttings. Divide in September to April. Tips: If grown as a perennial it will develop into quite a large herbaceous plant. It can also be grown as one ingredient of a hanging basket scheme, and discarded after flowering. Do you grow Bidens ferulifolia (Fern-leaved Beggarticks) in your garden? What is your experience with this plant? Please share with other fellow gardeners in the comments below! Do you sell Bidens ferulifolia (Fern-leaved Beggarticks) seeds or have plants for sale? You can place your advertisement here. Contact us now!